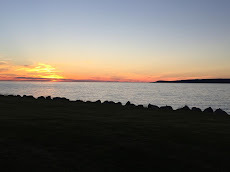 I mention Etsy frequently in these posts; if you look to the left, you'll see links to and pictures from my Etsy shop. All of these references assume that you know about Etsy; since Etsy doesn't advertise in the mass media, that assumption may not be fair. So let me tell you about this awesome website! Etsy.com, to quote their Trademarked slogan, is "Your place to buy & sell all things handmade". Unlike the popular auction sites, Etsy is not full of junk. It isn't the place to list when you want to clean out the back room. They've limited allowed items to art, handcrafted goods, supplies for crafting and vintage items at least 20 years old. Artists and artisans from all over the world present their work in their own "shop" area with their own unique internet address. There are support resources as well as forums for sharing tips and tidbits with other Etsians. There are wonderful galleries, called Treasuries, where Etsy members can feature some of their favorite work by other artists, feeding the co-operative and supportive atmosphere Etsy's creators set out to birth. Here's a screenshot of a Treasury I'm currently curating; it's dedicated to Dreamers. These temporary treasuries are fun to create and add a facet to the site experience that is difficult to quantify. If you're an artist, an artisan, a crafter or just someone who loves unique things, you owe it to yourself to take a look. There are multiple ways to look at the offerings, including searches by Category, Color, Location and innovative features like Pounce, where you can peek at what's just sold and other items from the same seller. You can browse all you like without joining. The membership requirements, should you care to buy or list items, are as simple as a user name and an email address. You can click on any of the Etsy buttons I've sprinkled throughout the post or go to http://www.etsy.com/ to start your handcrafted adventure! I've been having fun the last few days making wristbands. 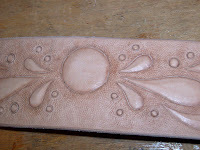 Don't get me wrong -- I love making my Earth Medallions and deer hide bags, but carving leather was my first love and remains the part of my craft I enjoy the most. Starting with blank leather and transforming it into a thing of enduring beauty and uniqueness brings me a deep sense of satisfaction. 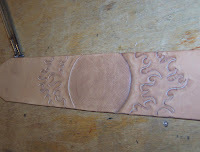 Wristbands are fun because they're small enough to allow me to carve several different designs in the same day. No sense in laying out the entire process in this post -- that was covered back when I started this blog in February. But here are three of my current batch in various stages from start to finish! Like any crafter, I have a working wish-list of tools. It's always a happy day when you can cross something off the list! My newest additions to my ever-growing workshop are two tools I think are must-haves for any leather crafter. 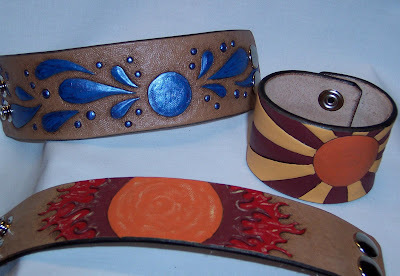 The first one comes with a reasonable price tag and is widely available at any leather-crafting supply outlet. It's a relatively new style of punch for lightweight leathers. It ha s a wheel that turns to allow for five hole sizes. It has an easy squeeze and punches a beautiful clean hole. 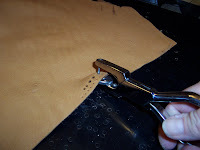 Even the smallest hole is distinct enough to stay open, which is a boon to anyone who sews leather like deerhide with a needle -- if you've been poking your holes with a scratch-awl, you know how hard it can be to find your hole once you get moving on the stitching. This punch removes that problem. My second new tool is one I have never seen at any leathercraft supply store. Despite over thirty years in the trade, I never saw this tool until my brief period of employment at a canvas & upholstery shop. 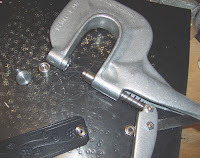 It's called a Pres-n-Snap and it's without question the best portable tool I have ever used for setting heavy-duty snaps! 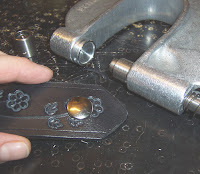 It comes with the parts needed to set both the male and female snap sides, as well as a setter for grommets. 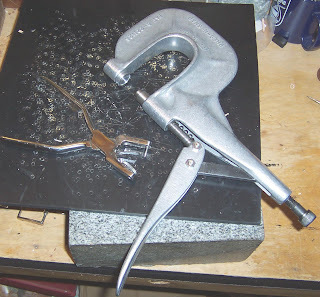 Built like vise-grips, it requires a bit of either strength or table-edge leverage. 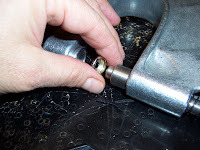 It sets the snap tightly and puts a good curl on the post. A bit pricey, but it will last for years. 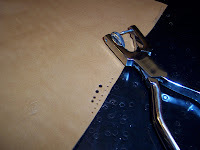 I don't know why the big-name leathercraft suppliers don't offer this tool -- it works every bit as well as the bench-setters they sell and it's easily portable, which is a boon for sizing belts at a craftshow! I located it by name through an internet search, and I absolutely love it! No more cussing and throwing away snaps because the inadequate drive-setters messed up another post! Of course, new tools means more work, right? Gotta go!